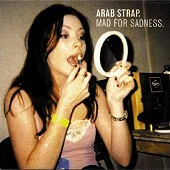 As laid back as they come, while still calling for a reaction, Mad For Sadness, the latest from Arab Strap, delivers manic pop. One moment it is crawling along like it is dead, so frail and lifeless, and then the next it delivers the same atmospheric darkness backed by an engaging percussion sound or two that makes you want to get up and dance slowly to the music. Preferring to talk over singing, the turtle-speed vocals and the haunting tunes that surround them send chills down your spine, hooking you on the unknown rather than with a sharp hook or catchy beat. If there is one thing Arab Strap does best, it is their ability to say a lot by saying a little and surrounding it by a lot of airy space. Still, when they want to make noise and pick things up, you'll be dragged along for the ride. That's for sure. I'll give this a B+.